Sky, aka EZ Vanilla Sky, is a 6-year-old black female. Born on July 14, 2000 to sire, My Rooster, and dam, Nita's Sweetie, Sky started her racing career at the Dubuque track in Iowa. Moving tfrom Iowa to Wisconsin, Sky's career spanned three years during which time she competed in 202 races at Dairyland and Geneva Lakes. She retired from racing in June of 2005, and is now ready for the easy life. With a sparkle to her eyes and a prance to her step, Sky is full of fun and personality. It is not known at this time if she is cat tolerant. 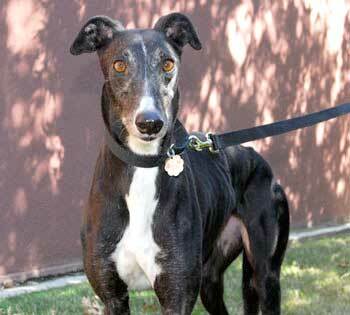 Sky is a 6-year-old very sweet black female. Since joining our family, she has been introduced to the small dog and seems to get along well with her. We have not yet introduced her to the cat in the family. She gets along with her canine brothers and sisters but much prefers the company of the humans. She is a talker and lets you know when she needs something; but be careful because she will likely come up behind you, push her head up between your legs and before you know it you will be riding her. She loves to nuzzle. Sky is also a collector and what a collector she is! She doesn't destroy anything but will very gently pick up anything on the floor, so if you are missing anything, it is likely to be found in her little pile of collections next to her bed. She fit into our household schedule very quickly but can't quite come to terms with the fact that the humans like to sleep in on Saturday, when she is used to eating at 5 a.m. Monday through Friday. Her potty habits are very good. She understands the schedule her siblings follow and so far has not had an accident inside. Sky has not been crated since joining our family. She sleeps at the end of the humans' bed each night and spends time during the day with her canine siblings in their room or running outside. She, however, does not seem to get in a hurry unless it is meal or treat time. Sky makes her preference for a particular bed known to the other dogs. 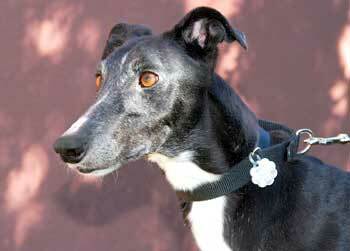 Unlike our other two Greyhounds, she isn't spooked easily and enjoys affection from small children. She has been very loving to our grandchildren when they have come to visit. After completing 202 races, this pretty girl is eager to finally reach her forever-home destination.